Tada! After all the online hoopla surrounding her casting, Jennifer Lawrence’s look for next year’s Hunger Games movie is revealed. Lawrence will star as tough- girl protagonist Katniss Everdeen, a teen forced to fight for her life in a post apocalyptic world. The movie is based on Suzanne Collins’ best-selling novel of the same name. Chatrooms have been buzzing for weeks about how blondie Jennifer Lawrence would morph into raven-haired, olive-skinned Katniss. I think this looks pretty damn good! But then again, I’m a fan of the actress and I think she was a great choice to play this strong heroine. The relative newcomer joins some heavy hitters for the movie version of The Hunger Games, including Stanley Tucci, Elizabeth Banks, and Woody Harrelson. I’m gonna try not to get to excited. . . but it will be pointless because this already looks like it’s gonna be amazeballs and actually a real movie and Mama can NOT wait until this puppy hits theaters! Last weekend I went to see “Water for Elephants” starring Robert Pattinson and Reese Witherspoon. I had recently read the Depression-era story of a young veterinary student who loses his parents, then hops a train that just so happens to belong to a traveling circus. I wanted it to be great, but I read the reviews so I had little to no expectations. 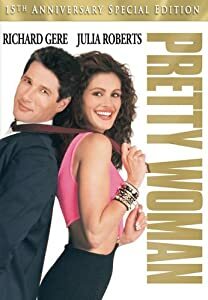 I have to say that I really enjoyed the movie as a whole, but (like pretty much everyone else) I didn’t get into these two stars as a couple. Their romance was forbidden (Reese’s “Marlena” is married to the circus’ owner), which should be exciting, but I just didn’t buy it. She seemed way too cranky, and Rob. . . well. . . his “Jacob” just looked bummed out most of the time. This boggled my mind because Reese is very pretty, and Robert Pattinson is stupid hot. I thought that was a no-brainer. The girl Jacob truly had chemistry with was “Rosie,” the titular elephant. Rosie was played to perfection by Tai, a gorgeous asian elephant. You can see in the way that Rob looks at Tai that he truly has a thing for her. It’s crazy. Why isn’t it that way with Reese? After a quick Google search, it’s pretty clear that no one else knows, either. There are lists on some sites for who has the best on-screen chemistry, but none can really explain why. To be sure, it’s not just two beautiful people, or romantic lighting. Plenty of awkward pairings have benefited from those things to no avail. If you ask me, there is no answer to chemistry. Just like in real life, I believe you can’t really help who you love. As an actor, this realization really hits home. I feel like there have been plenty of times that I “just wasn’t right” for a role. Things just didn’t click, no matter how much I wanted it. That’s why when the perfect part comes along- and the perfect person to play it does too, we see some real fireworks. The other night I was watching Access Hollywood and laughing at Charlie Sheen, when I saw a story that almost made me pee my pantaloons! Lifetime is currently making an original movie about Harry Potter scribe JK Rowling! S-to the QUEE! The movie, titled Strange Magic (get it? ‘Cause she wrote books about magic. Oh you kooky Lifetime kids!) begins when Rowling is 26- before she wrote any of the books. It’s a look into her young life, and the inspiration behind the story of Harry Potter. It’s set to air in July. I can’t wait for this movie. I love all things HP (just search “Harry Potter” on my blog and you’ll see), and I think Rowling’s story is mad inspirational. I really want to see the moment when the inspiration for HP comes to her (on a train!) played out on screen. Also, I expect the full Lifetime treatment on this movie. I highly doubt that Rowling herself had anything to do with this production, so it should be all kinds of crazy. I’m ready for questionable English accents and a cheesy montage of the first HP book getting rejected from numerous publishers. (If they can do that effect where all the rejection letters come swirling at the screen like newspapers that would be acceptable, too.) I also hope there’s a montage of her spending money in crazy ways once she becomes rich. Bring it on! I would turn into a puddle of water, too, Poppy! 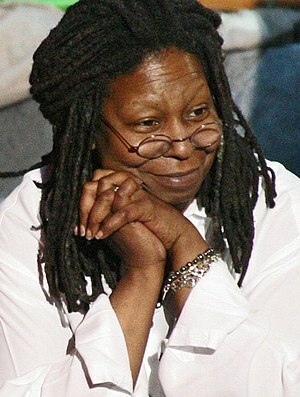 I love Whoopi Goldberg. When I was three or four, I saw a clip of her pretending to be a little girl who wore a pillowcase on her head because she wanted “long, luxurious blond hair.” I would crack my mom up by walking around the house wearing a pillowcase on my head because I wanted long hair, too. I watch “The Color Purple” at least once a year (usually two or three times), and watching either “Sister Act” movie is probably really annoying with me because I say all of the lines aloud. My mom likes Whoopi Goldberg, too. Growing up, we had a huge “Ghost” movie poster at the top of the stairs in my house (along with a “Five Heartbeats” poster for some odd reason). Why am I telling you these (mostly embarrassing) tidbits? Because I want you to know that what I’m about to say in this post comes from a place of love: Whoopi, you lost your mind last week. I’m glad you got it back, though. I love the part when she brings out her Oscar! That’ll teach those haters over at the NYT to forget Whoopi! Burn! Or, it would have been. If the NYT had actually effed up. In fact, the article never claimed to list all black Oscar winners. It was a critique of the lack of black stars in Oscar nominated roles this year. Even worse, many of the films released in 2010 had no black characters in them at all. This is actually a really important issue that should be discussed. Instead, we were all talking about Whoopi Goldberg. I get it. Whoopi is a cultural icon, and if the NYT had left her off a comprehensive list, she’s got a right to be pissed. But they didn’t, and when she realized she was wrong, she took two days to apologize (and even then it was kinda raggedy). I’m sorry, but getting an Oscar doesn’t mean you get to throw hissy fits whenever you want. * Maybe if she hadn’t been so caught up in needing to be mentioned, she would have read the article correctly. I guess I just feel like a lot of artists let their egos get in the way of reality. What we do is so important, but inflating oneself somehow takes away from the artistry of it, and makes it a game. Winning an Oscar is a big deal. I just wish that Whoopi had acted more like an Oscar winner, and less like a sore loser. *Okay, fine. Maybe it does. But the rest of us don’t have to like it. I mean. . . do I even need to say anything about what's happening here? In the last couple of days, Henry Cavill has become a hot topic, but most people knew little about this hottie before the announcement this week. Which was fine with me. You see, I’ve been a fan of Henry Cavill since 2002’s The Count of Monte Cristo, where he played the son of the titular Count. I remember sitting in the theater and thinking, “This whole Count being put in prison story is sad and stuff, but who the EFF is that guy playing his kid?! Show him more. SHOW. HIM. MORE!” True story. Image via Wikipedia, Sighs via Me! After that I went home and Googled (if you know me, you know I Google everything), and the lourve grew. I tried to catch Cavill’s work whenever I could. I swooned for his Melot in Tristan + Isolde, and was thankful to him for making Stardust bearable (I’m sorry. I know people really like that movie, but it was just weird). And then came The Tudors. If you don’t watch this Showtime series, you need to jam on it! 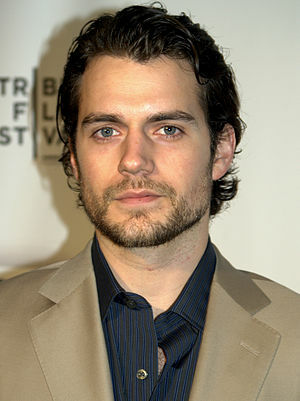 Henry Cavill’s turn as the Duke of Suffolk is something to see. He’s complicated, flawed, and shirtless for many of his scenes. Win-win. So, what do you think of Henry Cavill as Superman? Is it weird to have an English actor in this iconic role? And more importantly, do you agree that he is super hot?